Artists in Residence will lead and coach festival participants in guided rehearsals, private lessons, and performance classes. They will also perform in a public concert with other Artists and in a private concert with their assigned festival participants. An artistic visionary fascinated by music’s ability to cross cultural boundaries, Cassidy Chey Goldblatt designs performances that both connect artists across disciplines and engage audiences in the music-making process. She has spearheaded ventures such as the YInMn Project, a new-music festival intended to inspire performers and engage unexposed listeners; Converge, an Ann Arbor-based new-music collective; and multiple cross-disciplinary recitals involving improvisation, story-telling, and dance. Currently, Cassidy is developing the YInMn Project into a multi-state enterprise, planning tours with her string quartet Room 1078, writing story-song improvisations with Muqi Li, and completing a Master of Music under Markus Placci at the Boston Conservatory at Berklee. She earned her Bachelor of Music from the University of Michigan under David Halen, holding concentrations in violin performance and music history. See more at cassidychey.com. Born in Lima, Peru, violinist Jésus Saenz began his studies at age eleven at the National Conservatory of Music of Peru where he studied with Professor Laszlo Benedeck until 2006. During his studies, Jésus has been the winner of the National Violin Competition of Peru, making his debut as a soloist with the National Conservatory Orchestra at age twelve. As an orchestral musician, Jésus has served as principal second violin for the New Philarmonic Orchestra of Irving as well as concertmaster and guest concertmaster of several orchestras including: National Youth Symphony Orchestra of Peru, National Conservatory Symphony, Texas Christian University symphony orchestra, Sinfonietta of Fort Worth, Irving Symphony Orchestra, San Angelo Symphony Orchestra, “Filarmonica Joven de Colombia”, University of North Texas Concert Orchestra, and Boston Conservatory Orchestra. Jésus has represented Peru as a member of the Youth Orchestra of the Andean Countries, the Youth Orchestra of Latinoamerica (conducted by Claudio Abbado and Gustavo Dudamel) and the Youth Orchestra of the Americas 2014, 2015, 2016 and 2018 tour where he toured over 15 countries and performed with the finest musicians at the best concert halls around the world. He was also selected to participate in the “Global Leaders Program” of the YOA, in which he was able to teach and perform in Suriname and Trinidad and Tobago. Jésus also lead the “Symphonik Ecole Summer Camp” (Haiti 2017) and the Leandro lvina Miranda Institure violin workshop (Cusco 2016). As a soloist, Jésus has performed with many major symphonies in Peru, including the National Symphony of Peru, Cusco Symphony, Trujillo Symphony and the National Youth Orchestra of Peru. Since coming to America, he has performed as a soloist with the Fort Worth Youth Orchestra, Sinfonietta of Fort Worth, the Irving Symphony Orchestra and the San Angelo Symphony. In 2006, Jésus was granted a full scholarship from Texas Christian University where he completed his Bachelor’s Degree. Between 2011 and 2013, Jésus worked on his Artist’s Certificate under the instruction of Emmanuel Borok. In 2016, he completed his Masters of Music at the University of North Texas under the instruction of Julia Bushkova. Jésus is currently living in Boston, where he is pursuing a Graduate Performance Diploma from the Boston Conservatory at Berklee with Professor Lynn Chang. Antonina Styczen, a Polish flutist, graduated with distinctions from both the Fryderyk Chopin University of Music in Warsaw, Poland and Queen Sofia College in Music in Madrid, Spain, where she attended Jacques Zoon’s flute class. She graduated from the Professional Studies Certificate program in Sarah Brady’s flute studio at Boston Conservatory at Berklee where she is now pursuing an Artist Diploma degree. Antonina is a winner of the Astral Artists 2018 National Auditions. She is a laureate of numerous music competitions and a beneficiary of various scholarships. 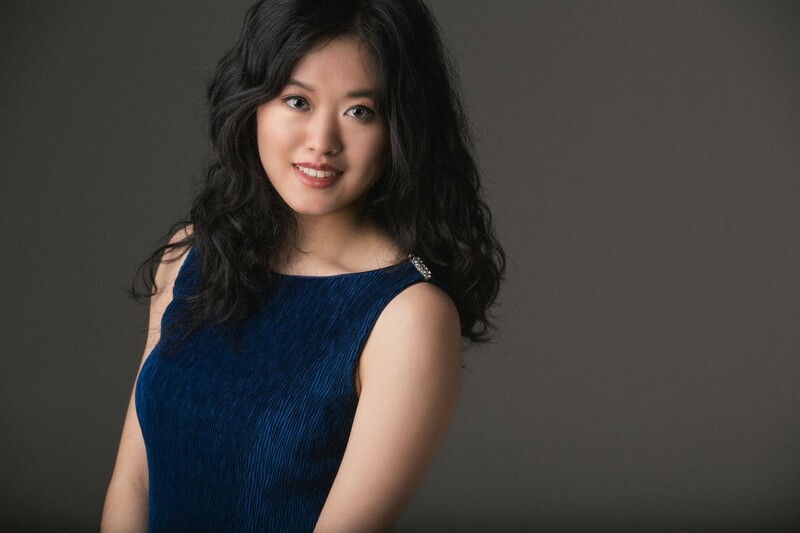 Hailed as a “valuable advocate for classical music from her generation” by NY Concert Review, prize-winning pianist and educator Angie Zhang is currently a Kovner Fellow at The Juilliard School, studying with Yoheved Kaplinsky and Joseph Kalichstein. This summer, she has multiple orchestral engagements and will be featured in pianoSonoma and Bravo! Vail Festival. A native of Portland, Oregon, Angie made her solo, chamber, and orchestral debuts by age ten. Her performance at the Arlene Schnitzer Concert Hall in Portland under Grammy-nominated conductor Neil DePonte won rapturous acclaim and she has appeared every season since as a soloist with major orchestras. She is frequently re-engaged by conductors and directors, and has collaborated with maestro Huw Edwards eight times in the last decade. In the past year, she made her harpsichord debut at pianoSonoma, and conducting debut at Alice Tully Hall in Lincoln Center as a three-time winner of the Juilliard Concerto Competition. Angie continues to expand and deepen her musical offerings through taking on diverse leadership and artistic roles, both in and beyond the concert hall. A veteran multi-disciplinary artist, she has presented dozens of interactive performances with actors and dancers of the Juilliard School, and has worked with critically-acclaimed choreographers Aszure Barton and Kate Skarpetowska. In addition, she has co-commissioned solo and chamber works by living composers and sung Verdi’s Requiem while on tour with the Barnard-Columbia Chorus. She is also the youngest person in the history of Juilliard to teach concurrently in the pre-college, college, and evening divisions. While simultaneously maintaining a significant performing career and full-time program of study, Angie has also contributed to the Juilliard community as Chair of Student Council, Student Ambassador, writer and photographer for the Juilliard Journal, tour guide, panelist, and orientation leader. She spearheaded an initiative at the Lila Acheson Wallace Library, prompting a work-study position to be created for her, and is Student Curator of a monthly newsletter that includes book recommendations from students, staff, faculty, and alumni; staff portraits; new acquisitions; and more. She also had the honor of serving on the Student Advisory Committee to assist with the presidential search process following Joseph Polisi’s departure, and spending the day of Commencement with Juilliard honorary doctorate recipients Ann Ziff and Murray Perahia. A socially proactive artist-citizen, Angie has raised more than $100k for various organizations, scholarships, and relief funds. She is also a 2018 Yamaha Young Performing Artist.